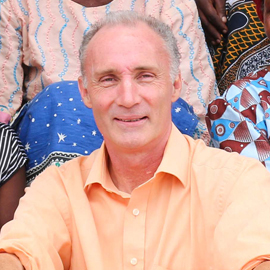 Martin Swinchatt recently joined our programme in Malawi as country director. Here, he shares his experience of his first few weeks working for Mary’s Meals. I’ve worked in South Sudan, Somalia, Kenya and in refugee camps but nothing prepared me for the enormity of the Mary’s Meals programme. My first impressions? Well, there’s a manic office and a hugely committed team with people working in everything from logistics to monitoring, evaluation and learning. Everyone seems to know what they’re doing! And what Mary’s Meals is doing clearly works. There are some amazing systems in place and it’s fantastic to see such remarkable amounts of data being collected. What’s really knocked me back about my first few weeks with Mary’s Meals in Malawi is the people. With the school holidays, I didn’t actually see any school feeding for my first few weeks but I did attend some community meetings, where the local volunteers hear about Mary’s Meals for the first time and learn more about what’s expected of them. You can see that people are just happy to hear their children are going to be fed. From the moment the training officer explained what they had to do, such as providing sand and bricks for the school kitchen, I expected to hear murmurs of “what have we got ourselves into” but there was no hesitation and no questions about where it would come from, everyone was committed to making this work. There are lots of traffic jams in Blantyre where the Mary’s Meals office is based (though nothing by Nairobi standards where I used to live!) Complete strangers recognise the Mary’s Meals logo on the trucks and come up to speak to us. The Mary’s Meals story and the impact that we have – it’s well known here. It’s a household name! Everyone who comes and speaks to me, they talk about Mary’s Meals with a smile on their face. They recognise what Mary’s Meals is doing and are happy and welcoming as a result. But I have to come back to the people. Our staff here are strong examples of people who are doing so much more than they have to. They’re always enthusiastic and so happy to help. We have a Logistics Officer called Catherine for example. She is four months pregnant so we said she didn’t have to join the team doing the backpack distribution to a school up north. Catherine was under no obligation to go but she insisted enthusiastically: “Of course I’m going! I don’t have to but I want to” and off she went! This amazing, cohesive team is full of enthusiasm and commitment and they’re really building in confidence too. All of the people in the field, they have this remarkable belief and positive outlook about where Mary’s Meals is going – it’s tangible. Of all the impressions I’ve gained from my first few weeks here, that is key – the pride and enjoyment people take from their work and the belief in what they’re doing. I’ve worked in different organisations and I’ve never met a team so dedicated to what they are doing. Two days into the job Chris (head of programmes, East Africa) asked me how it was going and I told him I’ve found what I was looking for. Working for Mary’s Meals feels right. I know I’m in the right place with the right people doing the right thing and it’s all thanks to an incredible bunch of people.